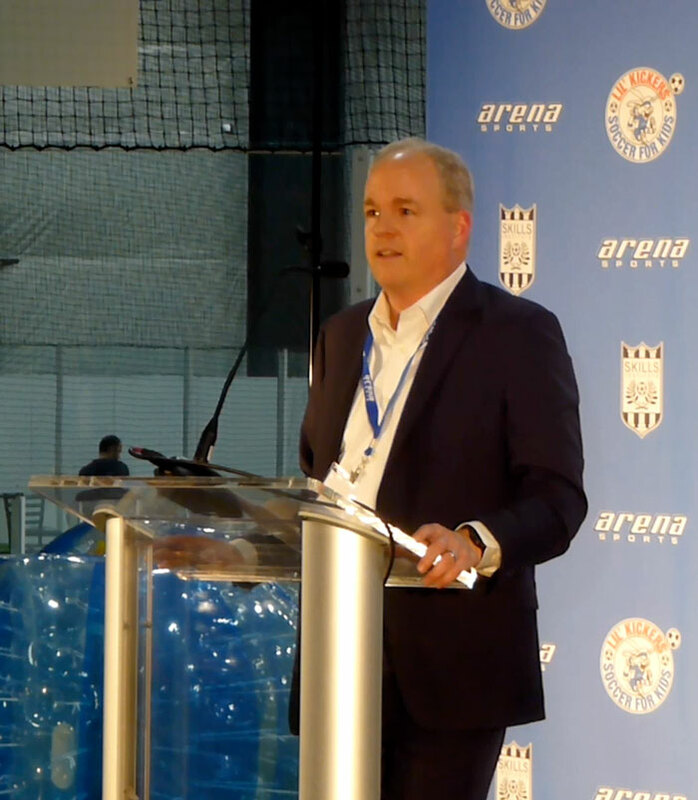 Arena Sports CEO Don Crowe at Mill Creek grand opening. Photo credit: Richard Van Winkle. Arena Sports officially opened their newest and largest indoor sports facility in Mill Creek on Thursday evening, January 25, 2018. The company hosted a grand opening celebration for 150 guests and their families to celebrate. Arena Sports first tried to develop an indoor sports facility in Mill Creek with a partner back in 2012. That development proposal was not approved by the city council because Crowe’s partner required the site to be rezoned for apartments as part of the development. In 2016 Crowe submitted another proposal without apartments to the City of Mill Creek, which was readily accepted. During his presentation Crowe talked about his expectations for the new indoor sports venue, "Our other four locations probably get about two million people a year going through, this one will get about a million." “City leaders have a clear vision for Mill Creek as a vibrant, family-friendly community,” said Crowe. Arena Sports Mill Creek offers competitive and recreational adult indoor soccer leagues (men’s, women, co-ed) as well as competitive and recreational youth leagues for kids ages five (U6) through high school. Kids 18 months to nine years old can join the Lil’ Kickers developmental soccer program and kids ages five to 12 can participate in the Skills Institute to learn technical and tactical skills and master fundamentals. More than just a fun place for soccer, Arena Sports locations offer indoor inflatable FunZone playgrounds, popular sports camps, and birthday party packages. The new Mill Creek location has a large Family Entertainment Center with bowling, laser tag, arcade games, and an on-site restaurant.